The Blitz, England. Black-outs and bombings. Death, loss, illness, fear. It’s a broad and powerful canvas. Sick and grieving young Emmaline finds purpose and magic when she discovers that winged horses live in the mirrors of a grand English manor-turned-children’s hospital. Megan Shepherd’s award-winning middle fiction book “The Secret Horses of Briar Hill” (Walker Books 2016) isn’t really about horses but your young reader won’t care. Levi Pinfold’s illustrations bring this world to life with incredible, almost photo-realistic sketches created from his imagination. Intense and evocative. If your reader loved The Secret Garden and The Chronicles of Narnia – they’ll enjoy this. I understood. Really. Who could resist that cover? My review copy of “See You When I See You” by Rose Lagercrantz and Eva Ericsson. Gone. My sleuthing didn’t take long. Cue defiant nine-year-old. “Why do you need it?” comes her careful, tinged-with-defiance reply. Her eyes flick up at me, contemplating my alive-ness. Her shoulders rise and sag with a giant exhalation. She goggles her eyes rodent-style and laughs. A grand, skywards arc of hand, a breathy sigh… then she (and the book) are gone. Lagercrantz and Ericsson (Sweden) are long-time friends and collaborators and it shows in this beautiful dance of words and pictures. The stories are rooted firmly in the domestic world – main character Dani navigates the subterranean complexities of home and family life, school and friendship. The adults in Dani’s life are fallible and she grapples authentically with a good measure of grief and disappointment. Neither trite nor heavy-handed, the serious business of growing up is balanced by a sense of wonder and flourishes of twinkling humour. This series will most likely appeal to 5-7 year-olds as a read-together or an independent read for 7-9. We’ve eagerly anticipated and loved every book. Classics. With thanks to Gecko Press for the lost and found review copy. 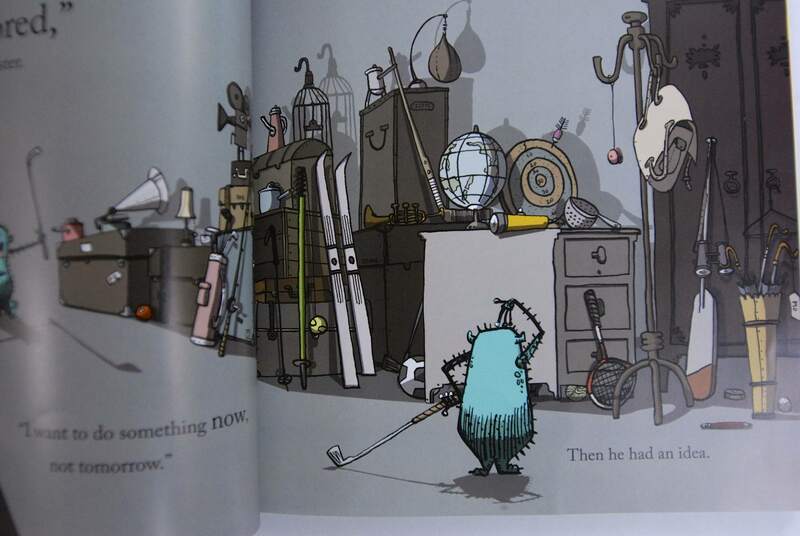 Time has passed in the Mo household since the arrival of the little blue monster who, like a rumbustious toddler, crunched, munched and chewed his way into the orderly lives of Mr and Mrs Mo in “Mrs Mo’s Monster” (2014). 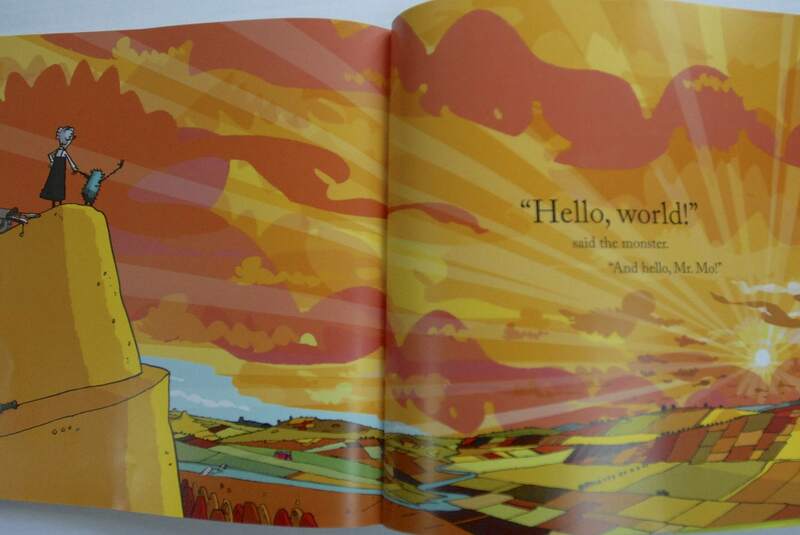 Author/illustrator Paul Beavis continues his droll depiction of the little monster in “Hello World” (Gecko Press, September 2015). Little Monster is bored. 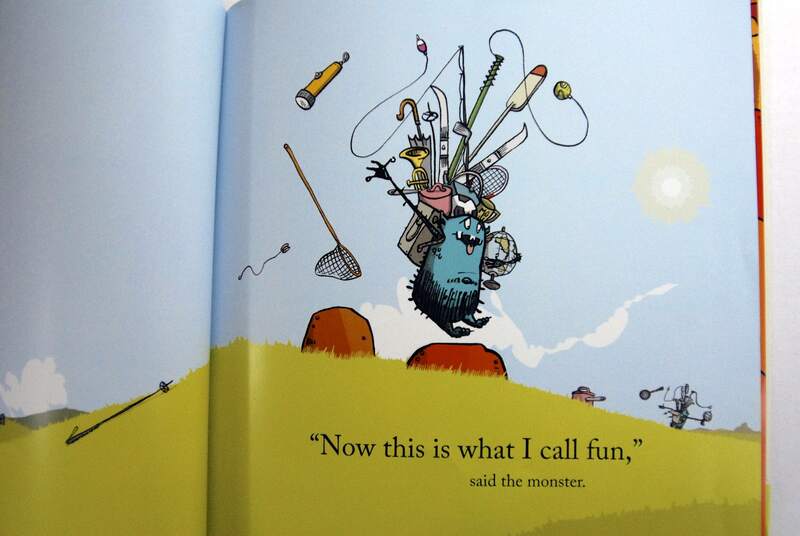 Mr and Mrs Mo are busy with no time to play – in classic parent fashion, Mrs Mo tells him “we’ll do something fun tomorrow.” That doesn’t cut it with the monster for whom, like most human children, it’s all about the now. He sets off with a spinning globe under his arm and knapsack heaving with attic-tat; trumpets and trophies, rackets and bats. Heading for the hills, he’s having a brilliant time, oblivious to both the trail he leaves as things fall out of his bag and the furtive Mrs Mo who is follows at a safe distance, gathering it up behind him. But the landscape looms and the shadows lengthen and the little monster begins to tire. Forlorn, he tosses the globe aside and regards his now empty rucksack. Beavis’s use of visual foreshadowing is brilliant here. 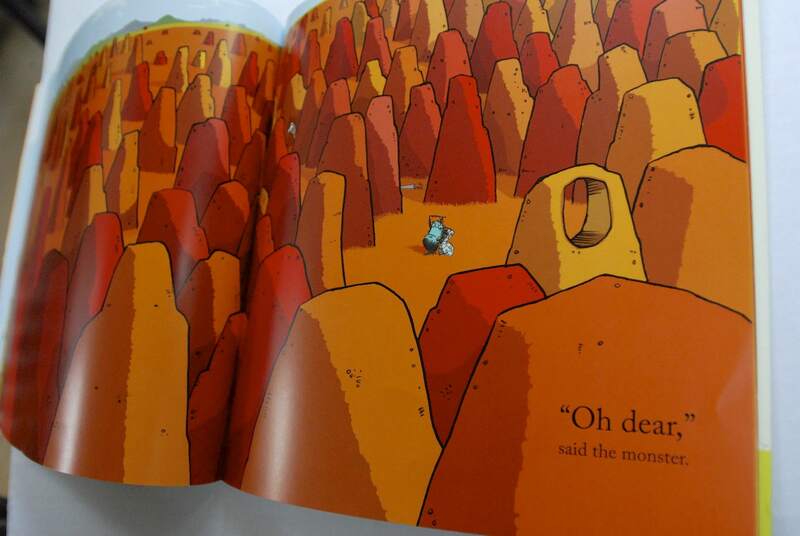 It’s the “all is lost moment” for the monster but little readers will delight in spotting the long shadow of Mrs Mo (and the collection of junk) just behind a nearby rock. 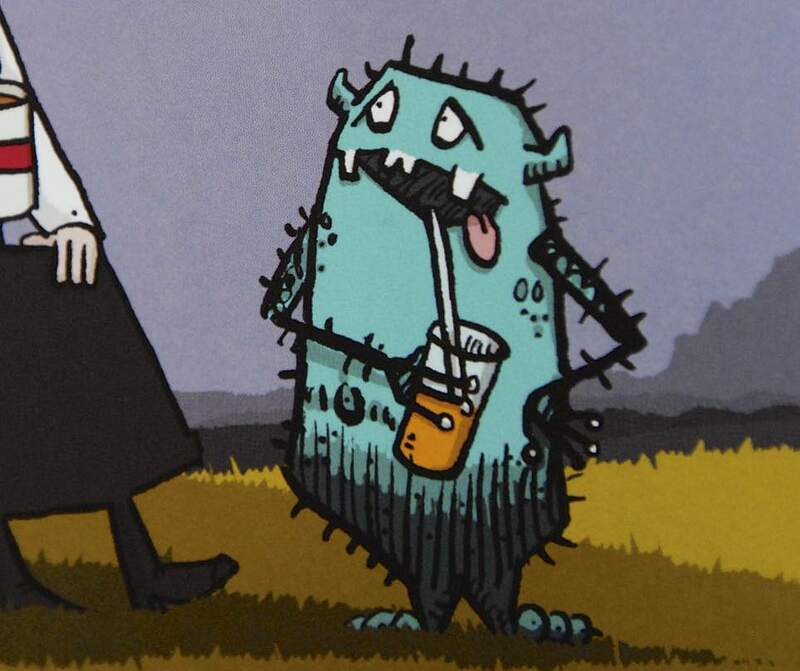 Equally delightful is the monster’s facial expression as he clutches her with relief. Ever-cool, Mrs Mo says she thought he might be “missing a few things” and offers him a sandwich. The monster gratefully accepts “just the one.” Restored, he leaps up from amidst an impressive pile of crusts and sweeps Mrs Mo forward on the adventure. Together they climb, the monster reassuring Mrs Mo all the way to the top where they are rewarded with a glorious vista of fiery sunset and patchwork fields. There’s an amusing reversal here as Mrs Mo appears unsteady and moots heading home. Little monster’s torch beam cuts impossibly through the darkening sky as he bravely declares “I can show you the way!”. 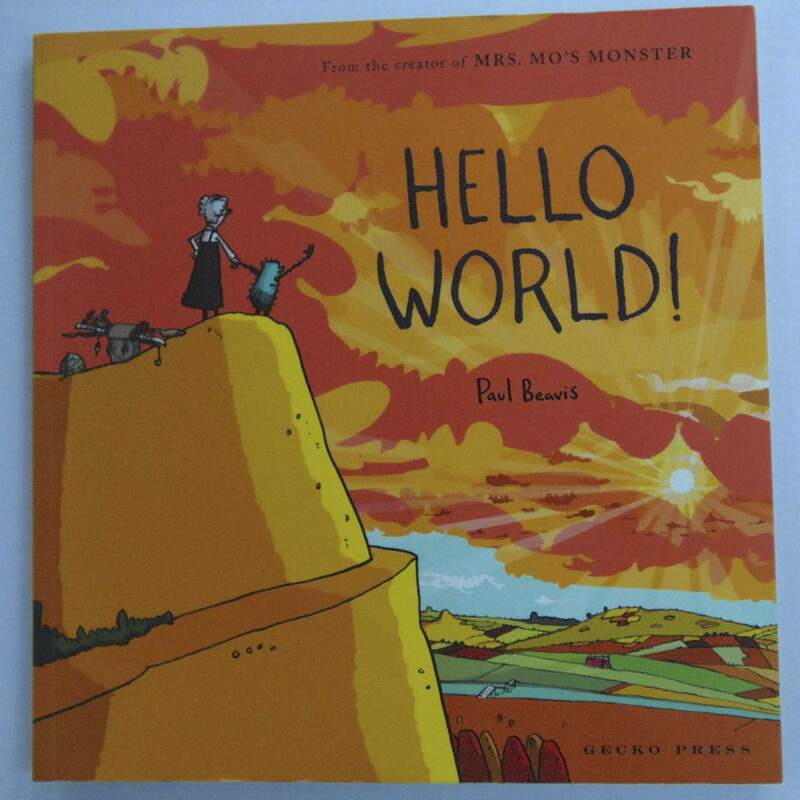 Parents will love the monster’s childish provocation at the end and Mrs Mo’s benign response (and Mrs Mo, cuppa in hand, literally on top of the world). 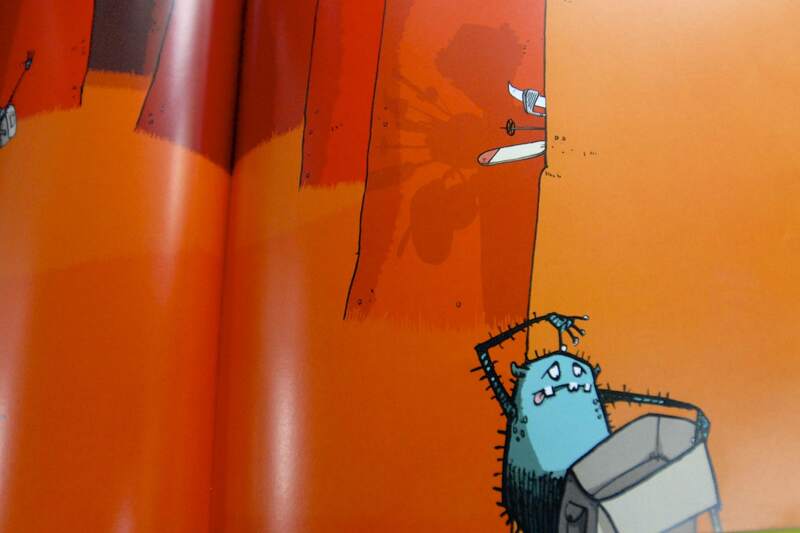 Beavis has a strongly narrative and striking illustrative style. The perspective shifts are brilliant – from the tiny, trailing Mrs Mo who ultimately (and heroically) fills a page, to the confines of the rock landscape that opens to an climatic epic vista of land and sky. Judicious use of colour heightens the sense of intensifying menace with benign blue skies and green fields at the beginning of the adventure giving way to the the fiery reds and ochres in the canyon. 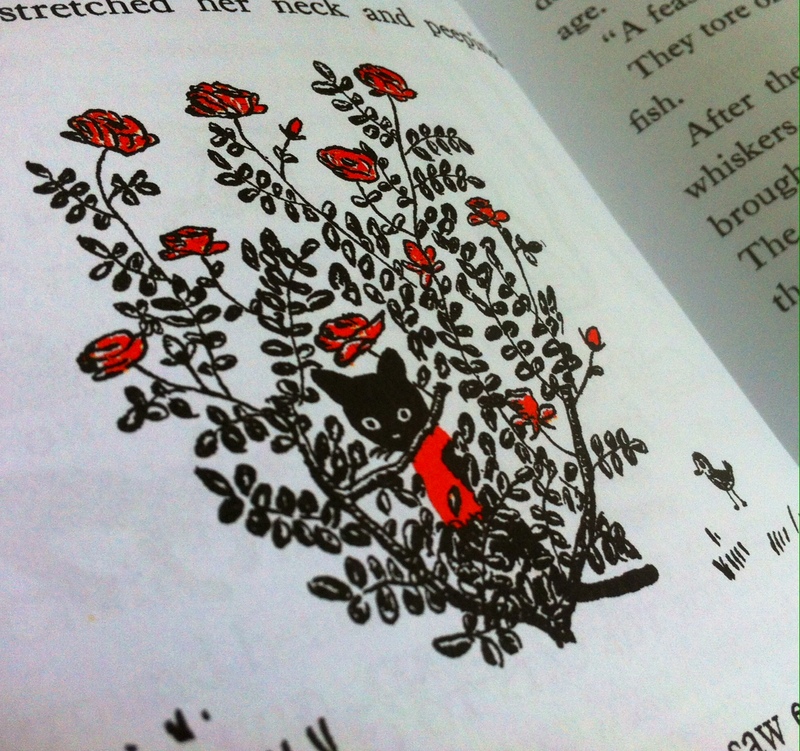 This charming fable is warm and exuberant. Young readers will love looking for the steadfast Mrs Mo on every page almost as much as they will identify with the kaleidoscopic emotion and energy that is Mrs Mo’s Monster, growing up. With thanks to Gecko Press for providing a review copy. In the last few years New York Review Books, with a stroke of brilliance, have been unearthing and reissuing classics for children (and their big people). These range from picture books for preschoolers to early chapter books and novels for older children. Beauties like The Backward Day by Ruth Krauss, Palmer Brown’s Hickory, The Thirteen Clocks by James Thurber and The Magic Pudding by Norman Lindsay. Check out the NYRB pages – they group these treasures by reading age. Objects to admire, beautiful to hold – these hard-cover editions have red cloth spines and many include original endpapers, line art, and full-colour illustrations. The covers in the collection feature a unified series design and materials are carefully selected to reflect the period of original publication. 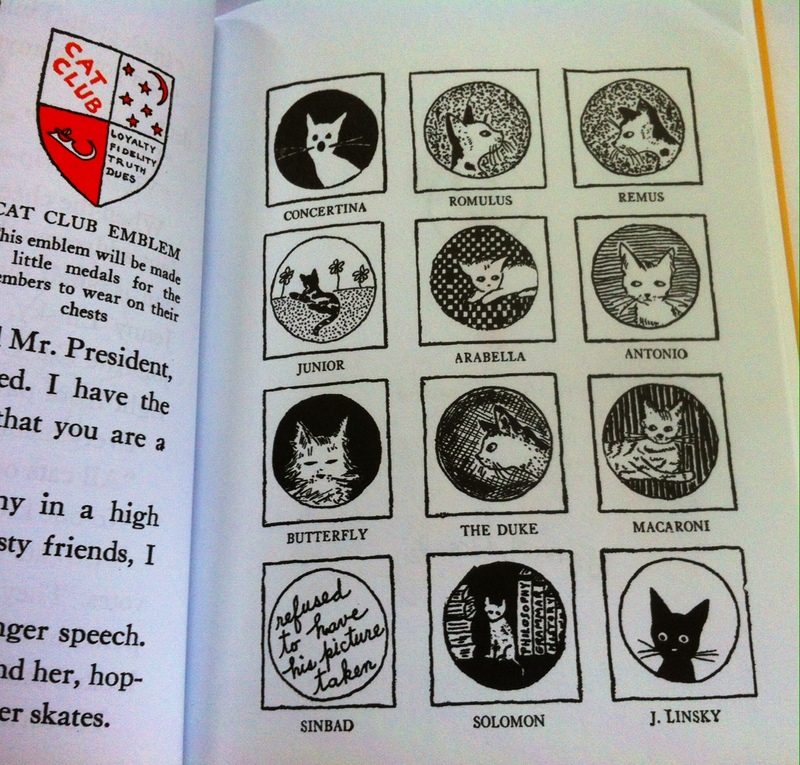 One of our favourites is Esther Averill’s Jenny and the Cat Club: A Collection of Favourite Stories about Jenny Linksy. First published in the 1940s and 50s, these simple stories are about an orphaned black cat who lives happily with her human, Captain Tinker, in New York’s Greenwich Village. Jenny is sensitive and shy yet has social designs – she longs to be part of the cool Cat Club. 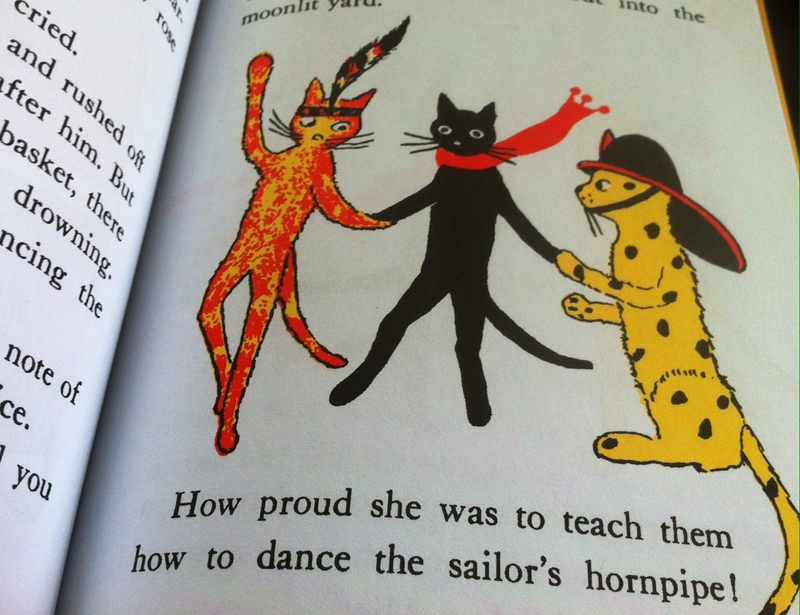 The members of the Cat Club meet regularly to party in Captain Tinker’s garden. All the cats in the club have distinct personalities: – the elegant Persian Butterfly (who plays the nose flute), the lively twins Romulus and Remus, sweethearts Arabella and Antonio, clever Solomon who can read and generally sits atop a pile of books, naughty Macaroni, club-fighters Sinbad and The Duke. The club is presided over by a well-fed feline by the name of, unsurprisingly, Mr President. Every cat knows its place in the club and the only way to get membership is to prove a special cat-talent. It’s a club that demands excellence of it’s members. Daunting? Meow. 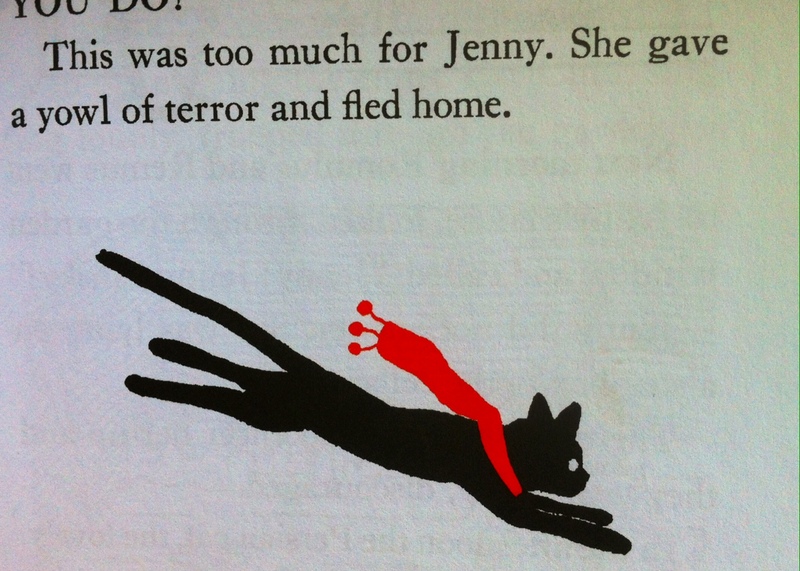 As she gains acceptance to the Cat Club and throughout her later adventures with them, Jenny struggles with emotions common to all children. Dealing with bullies, feelings of being an outsider, jealousy, insecurity, loneliness and embarrassment. The stories are a helpful and reassuring exploration of feelings that a 5-8 year old might feel if they were new to school or moved to a new neighbourhood. Or within any given school day. And our gallant protagonist Jenny overcomes these feelings with support (yay Cap’n Tinker), persistence and a very quiet courage. Some might find the slight formality and occasional didactic tendencies a bit cringey. 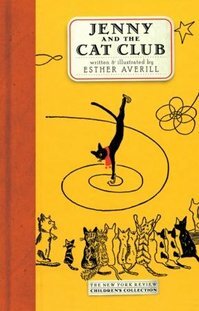 But Averill writes with almost a nonchalance that anchors the whimsy of the cat-club world. And any kid who has a cat or loves cats will be entranced by the simple, sketched drawings that perfectly capture, well, the cat-ness of these characters. Despite their weakness for accessorising (Jenny is lost without her scarf, Pickles wears a fireman’s helmet and Florio borrows an Indian feathered head-dress from a doorman) these cats are not just humans with fur. Jenny pokes her paw in a crack in the sidewalk “as if she hoped to find a penny.” Her new brother Edward makes his “office” in a corner of the closet behind Captain Tinker’s rubber boots. When Jenny is afraid she spends the day sleeping in a soapbox in the cellar. In another incident she hides under the sofa after scratching Captain Tinker. This affectionate attention to cat quirks are everywhere – the characters stretch their necks to peek, curl up, flee in terror, lick their fur and groom their whiskers. Seventy years young, these charming, graceful stories are perennially modern, as all great books should be. Jenny and The Cat Club should appeal to both boys and girls as a read-aloud 4-8 years and for independent readers 7+.